Our Home is suited to discerning guests, couples or families. It has been set up for our family and friends so is NOT the usual rental place. Even though it is a 3 bedroom home, the main living level has main bedroom so the downstairs area (with 2 bedrooms and study) can easily be separated off if not required so it is still very good for just 1 couple. All beds are luxuriously fitted with electric blankets and cosy duvets and the beds are comfy. Floor to ceiling glass brings the view inside, so you only have to move from one chair to another to appreciate the beauty of our garden, the mountains and the lake. You don't even have to go outside on the balconies (which extend from every room) to appreciate Queenstown. Relax in leather recliners in front of the TV with surround sound with an open fire burning, and still take in the sunset. A reserve in front provides additional privacy and our trees and garden hide our home from the road, and minimise any noise. You can walk through the reserve to the town for a more scenic walk rather than down the hill. The kitchen is equipped with modern appliances and perfect for gourmet cooking at home. We have a dishwasher, bread maker, blender, microwave, sandwich maker to name a few, and the crockery, glassware and cutlery is high standard. If you prefer, you can cook a barbecue in our entry courtyard and enjoy a casual meal in the solarium which is always warm and looks into our front garden. The spa bath in the ensuite is a perfect way to unwind after a day out walking or skiing. As we are set up for our own family we appreciate the needs of young children and have a cot, highchair, stroller and even car seats. Just ask if you would like any of these provided. We have our Subaru available if required at minimal cost. It is well suited for around town and trips to Arrowtown, Glenorchy, Te Anau and Milford Sound so is great for sightseeing. There is no other place like Queenstown. Uniquely spectacular, and combining all sorts of adventure and relaxation activity, beautiful scenery, and the wonder of the outdoors, with world class shopping, entertainment, restaurants and bars. Four distinct seasons and four different appeals to the senses. 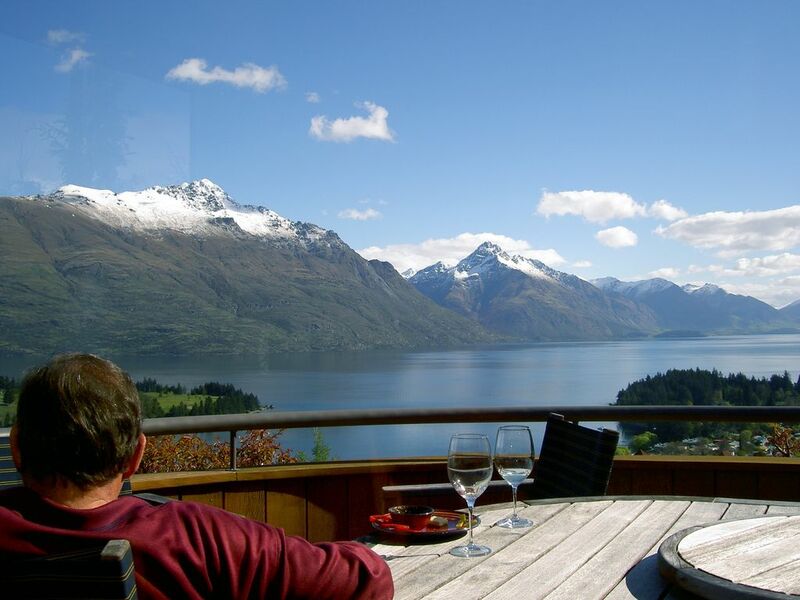 Our Home has panoramic views over Lake Wakatipu and the mountains. It is a few minutes into the heart of Queenstown, and an ideal stepping off place for local sightseeing. International visitors 'downunder' should do OZ and NZ in the one trip and marvel at the contrasts. Locals will know that Queenstown is the adventure capital of the Asia Pacific region, and is like the Swiss Alps just a few hours from home. I am semi retired and move between Queenstown and Sydney, where my family live. I love scenery and gardens and find Queenstown an ideal place to enjoy with family and friends. We fell in love with Queenstown after staying just one night in 1968. We love the location and after all this time, it is still beautiful. We have been able to share this with our family and friends and now open it to select guests. Our Home is on the Queenstown Hill above the town where you can relax inside or outside on one of the numerous decks and enjoy the views and scenery. Our Home has it all...luxury, comfort, views, privacy. We have modified our Home to make it comfortable and cosy and it is a pleasure to be in, regardless of the season. Underfloor heating in downstairs areas. Ceiling heating upstairs and also heated tiles. Booster heaters as well....you won't be cold in our cosy home. Electric blankets on beds. All bedding is provided. Good quality. Comfy donnas and bed heaters. Open (well stocked) fireplace in living area which opens onto 2 balconies with extensive views down the lake and up to the Skyline gondola. Plenty of parking off street. Our Subaru is garaged and this is available if required for minimal extra charge. Wifi with limitless download. Fibre optic for speed. Sheridan good quality towels provided. 2 male & 2 female cosy bath robes also. Unlimited broadband provided. Fibre optic connection. Open plan living areas all open to balconies. There are exceptional views of the lakes and mountains from every chair you choose to sit in. F&P titanium Active Smart. Freezer below Refrigerator. Basics for tea, coffee, sugar, spices, sauces. Some tinned food for emergency use ...guests replace with same or similar. More than enough crockery and cutlery. All good quality. Well appointed kitchen adjoining conservatory (breakfast room). Fully equipped with quality appliances, crockery, glasses and cutlery. Timber table and chairs set up for 6. (2 extras can be added). Dining area opens onto balcony and has views down Lake Wakatipu. Cards and Board Games for all ages available. CDs available and you can plug in your iPhones. This is a beautiful area from the downstairs bedrooms. Also has a clothes line. Numerous balconies come from the living areas and bedrooms. Entry from main living area is directly from road.